In this study, we used an Unmanned Aerial Vehicle (UAV) to collect a time series of high-resolution images over four years at seven epochs to assess landslide dynamics. Structure from Motion (SfM) was applied to create Digital Surface Models (DSMs) of the landslide surface with an accuracy of 4�cm in the horizontal and 3�cm in the vertical direction. The accuracy of the co-registration of subsequent DSMs was checked and corrected based on comparing non-active areas of the landslide, which minimized alignment errors to a mean of 0.07 m. Variables such as landslide area and the leading edge slope were measured and temporal patterns were discovered. Volumetric changes of particular areas of the landslide were measured over the time series. Surface movement of the landslide was tracked and quantified with the COSI-Corr image correlation algorithm but without ground validation. Historical aerial photographs were used to create a baseline DSM, and the total displacement of the landslide was found to be approximately 6630 m3. 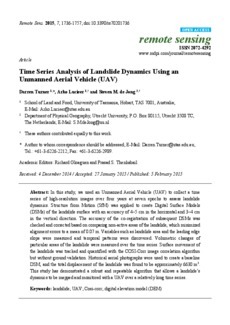 This study has demonstrated a robust and repeatable algorithm that allows a landslide抯 dynamics to be mapped and monitored with a UAV over a relatively long time series.